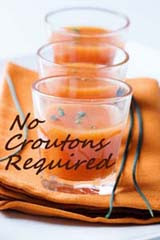 It's Lisa's turn to host 'No Croutons Required' this month: "As the winter holidays are soon upon us, this month I want you to come up with a vegetarian soup or salad that you would serve as part of a special holiday meal. It can be simple or elaborate - the choice is up to you." We had a family party yesterday, it's usually a pre-Christmas party, but the weather has prevented us from holding it a couple of times, so we decided to bring it forward. 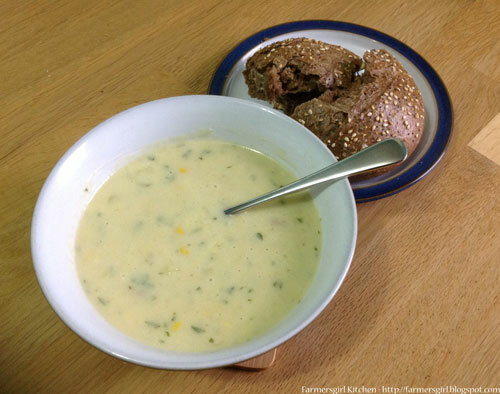 The soup I made for this celebratory meal was a Sweetcorn Chowder, it was easy to make and lovely and creamy, the herby cheese really adds to the flavour and I had lots of positive comments from my guests. 1. Sauté the shallots in the olive oil gently for 4 minutes, making sure they don't colour. Cut the potatoes into small cubes. Add to the shallots and cook for a further 2 minutes. 3. Add the frozen sweetcorn to the pan along with the stock and bay leaves. Mix well, bring to the boil and simmer for 20 minutes.